Picking out switches and switchboards may have been something inconsequential a decade ago, but today, selecting modular switches isn’t an easy task. Modern modular switches come in a variety of colours, textures, designs and finishes. However, if you happen to have the standard white or off-white switchboards, you can transform them to match your furniture or décor, or even show off a hobby! 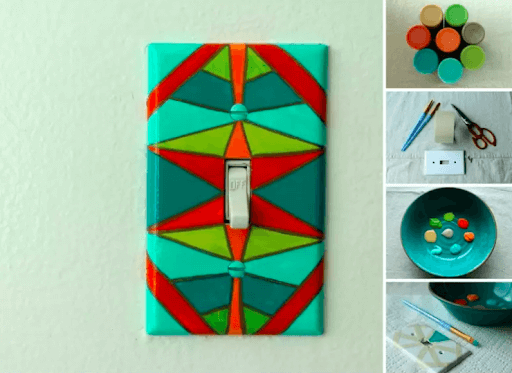 Take a look at these creative switchboard designs that you can try your hand at. Painting your switchboard is one of the easiest ways to add some colour to an otherwise plain background. All you need are some acrylic paints, paintbrushes and hairspray. Channel your inner Van Gogh and paint your favourite scenery on your switchboard. Alternatively, look for some inspiration online and try some abstract patterns or geometric shapes. Pay attention to the colours of the room or theme and match your paints accordingly. Once you’re done, spray over with hairspray to help the colours adhere to your switchboard. You can get as creative as you’d like with your switchboard decorations. 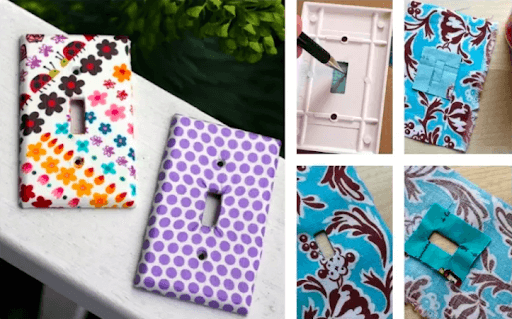 If you have any decorative material at home or colourful fabric, use them to cover up your switchboard. Use a ruler and measure out the size of your switch case on your fabric or paper. Remember that your template must be 1 ½ inches larger than your actual switch plate. Place your switchboard face down on the paper or fabric and glue in place, paying particular attention to the sides and inside flaps. Wait for a few minutes until the glue has dried completely. Looking for a simple but effective switchboard decoration? Try using some decorative stickers. They’re a cost-effective way of sprucing up your otherwise plain switchboard. These stickers come in many designs, colours, styles, cartoon characters, etc. Just be careful while sticking them on as they adhere very quickly to surfaces. 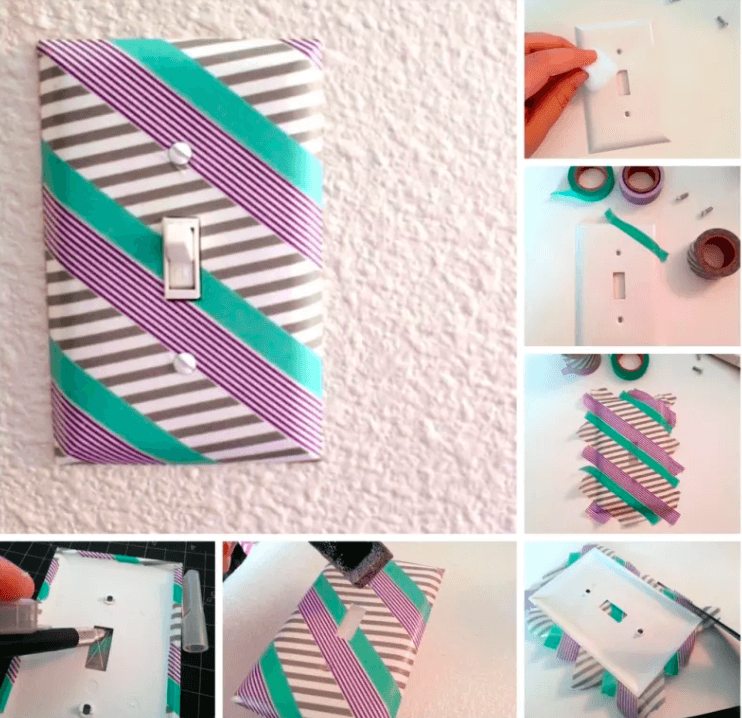 Similar to decorative switchboard stickers, washi tape, too is an extremely simple DIY decoration for your home switchboard design. Before you stick them on, clean your switch plate. Any dirt or dust will interfere with the tape’s adhesive. Experiment with different colours and patterns until you find the perfect match to your home’s décor. Just be sure to cut off the excess bits at the end to tidy up your switchboard decoration. Glitter is the ultimate way to give new life to your white switchboard! All you need is a bottle of glue and your glitter of choice. Simply apply the glue all over the switch plate and sprinkle over your glitter. 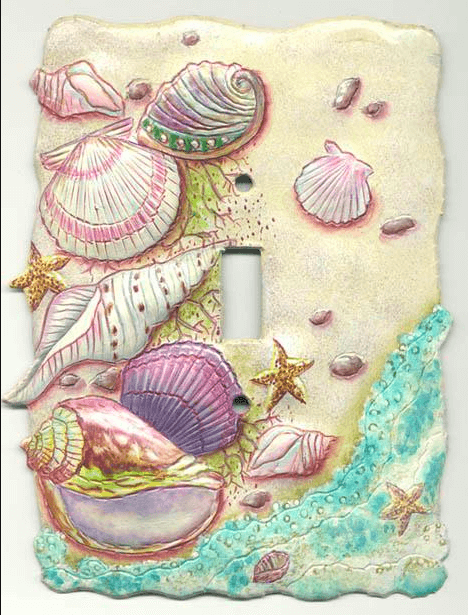 Set it aside to dry before fixing the switchboard back onto your wall. 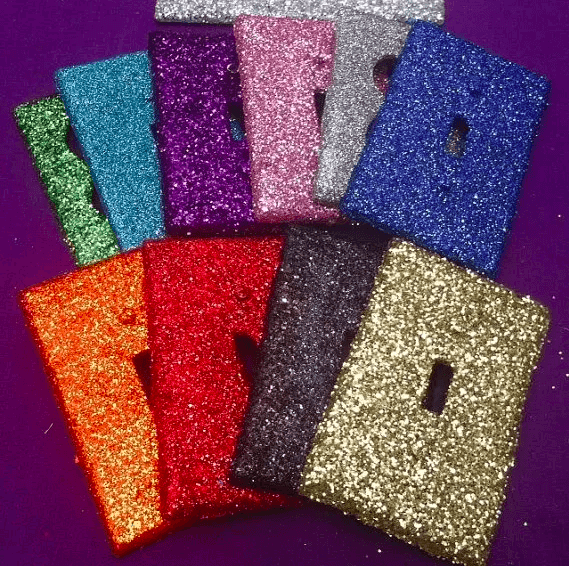 Using glitter as your switchboard decoration makes for a lovely addition to your child’s room. You can use a single colour all over the switchboard or with a little patience, use different coloured pigments in different designs. Remember to spread out some newspaper over your workspace as glitter can get messy and spread very easily. Post-it notes or sticky notes are most commonly used as little memos or reminders. 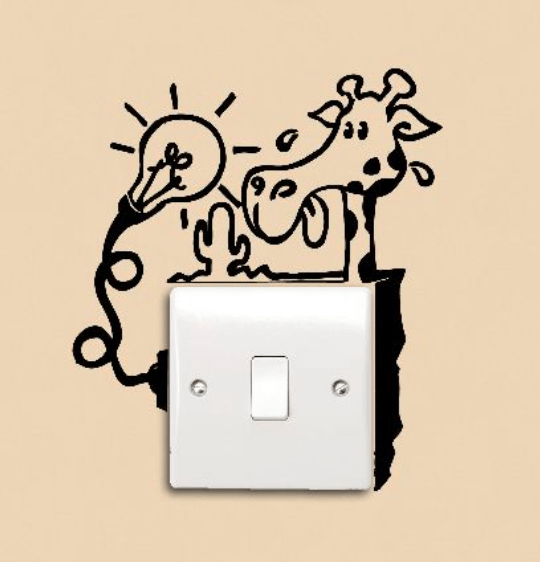 But now, you can turn them into creative little switchboard stickers as part of your home switchboard designs. While there are some sticky notes available with a hole in the centre, you can just as easily by a regular pack and cut out a space for your switches. 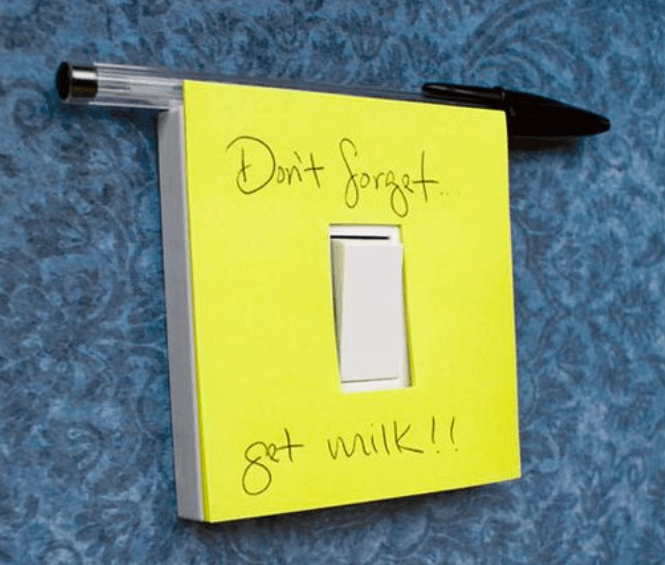 By using sticky notes as your switchboard decoration, you simultaneously give your switches a quirky new look while also leaving little reminders. Let the ocean inspire you and bring some fun and freshness indoors by using some seashells or aquarium gravel. You will need a hot glue gun for this project as regular glue will not be a strong enough adhesive option. You can start with smaller shells around the space for your switch and place larger ones around the edge or just the corners. If there is any space in the middle, you can fill it in with aquarium gravel or sand from the beach. Set this aside to dry overnight as it will take a long time to dry. With these ideas, you’ll be able to transform your switchboard from dull to designer. If you’re looking for some new modular switches, head over to Finolex. You can also read our blog on five things to keep in mind when selecting the right switch.